OK, so Labor Day’s officially over. So in my book, that signals the beginning of Halloween season! With that in mind, I thought it would be fun to share some of my favorite Ohio Halloween season memories; ghostly blasts from the past, if you will. They won’t be in any particular order. Just sort of random memories as they pop into my head or I come across them on my hard drive. 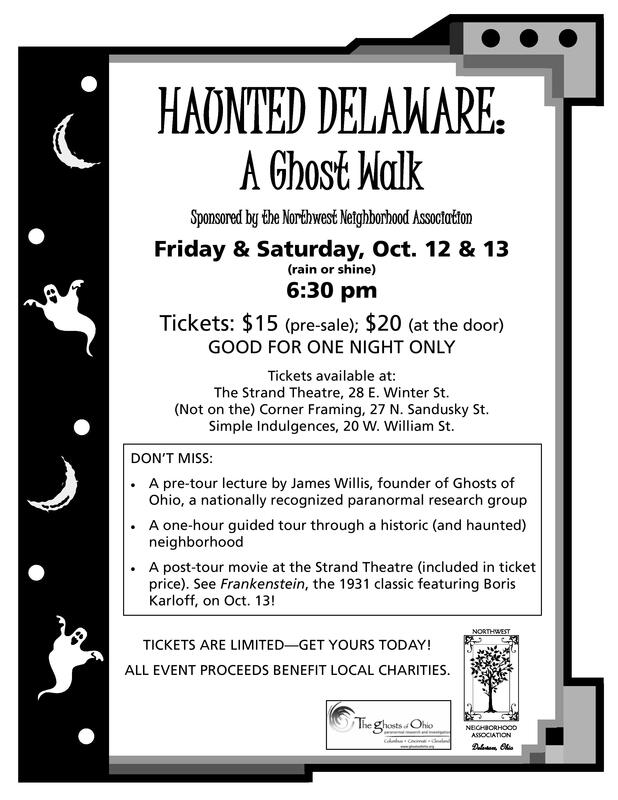 And we’ll begin with the Delaware Ghost Walk from October of 2007. I always look back fondly on the 2007 Delaware Ghost Walk, and not just because it was the first one The Ghosts of Ohio participated in. Sure, there was that, but it was also a blast because this was the first instance where we were having to do a two-day setup since the Ghost Walk that year was taking place over two nights. The Strand was open the entire weekend, too, so we ended up using some pieces of plywood to prop up the projector out in the seating area…and then parking Darrin Boop next to it so people didn’t bump into it during the presentation. After Friday’s presentation, we had to break everything down and then set it all back up again Saturday night. The 2007 Ghost Walk also holds a special place in my heart because so many members of The Ghosts of Ohio got involved, and not just with the presentation itself. Naturally, they were there, as always, to help me set up my 45-minute presentation on both nights, but they also worked the merchandise table and some members even donned costumes and helped out on the ghost walk itself, working as tour guides. Members of The Ghosts of Ohio hanging out at the 2007 Delaware Ghost Walk.